In Living Revision, award-winning author and teacher Elizabeth Jarrett Andrew guides writers through the writing and revision process with insight and grace. 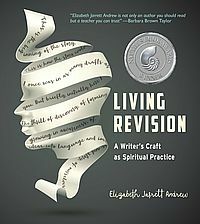 In Living Revision, award-winning author and teacher Elizabeth Jarrett Andrew guides writers through the writing and revision process. With insight and grace, Andrew asks writers to flex their spiritual muscles, helping them to transform their writing as they in turn transform into more curious and reflective human beings. Her expertly honed techniques, exercises, and personal examples will help writers invigorate their work and themselves as they engage the human heart within and across the page. Living Revision is no mere guide with tips and tricks—although it does have those—but a deep and reflective well for writers to draw from as they strengthen their relationship to the creative source. Writing is revision, the professionals claim; writing is the gut-wrenching, revelatory, dogged work of developing a story. Yes, writing is revision. But I’m here to say that revision is not just for the professionals or those wanting an audience. At its most basic, revision is seeing anew. Revision is the complicated, profound work of creation—an act that simultaneously creates within and through the creator. Revision changes the writer, deepens the writer’s work, and infuses that work with the potential to move readers. Revision addresses our innermost longings. At its core, revision is the spiritual practice of transformation—of seeing text, and therefore the world, with new eyes. Done well, revision returns us to our original love. In Living Revision, award-winning author and beloved teacher Elizabeth Jarrett Andrew demystifies the writing and revision process. I love this book. It’s full of inspiration but also practical tips and exercises to guide any writer into deep revision. With this book as their roadmap, countless writers will learn to open their hearts and transform their writing and, in the process, themselves through revision. It is a must-read for any writer serious about her craft. I know I will turn to it again and again. How does a writer use the fertile space between drafts to engage mystery, shape a manuscript, and produce a strong revision? Revision is born of questions, not corrections, says Elizabeth Jarrett Andrew, and her excellent book shows us how to ask good ones. As I read Elizabeth Jarrett Andrew’s Living Revision, I found myself breathing a sigh of relief. Here, finally, someone has articulated both the struggles and joy of revision, in a way that makes me eager to dive back into the projects that have stymied me. In addition to using examples and wise advice from other writers, Andrew gives us practical exercises that enable us to truly invigorate our work and revive its elusive heartbeat. Good writing comes from rewriting. Unfortunately, many beginning and intermediate writers lack the skills and inclination to go beyond mere copyediting and proofreading to explore the full creative potential deep revision can offer. Even experienced writers want to shy away from the love-hate relationship we have with the effort, agony and commitment revision requires. Elizabeth Jarrett Andrew’s honest revelations of her students’ and her own struggles and successes offer solace. Her straight-forward discussions of the theory and application of revision will inspire and motivate emerging and experienced writers alike. Living Revision’s practical techniques and pragmatic tools are a valuable addition to every writer’s skill set. Don’t just buy this book to adorn your bookshelf—keep it on your desk and use it!